Merry Christmas, happy New Year, yadda yadda yadda… The following is a short review of the bottle of Harrington’s 25 Old Spice Spiced Ale Special Reserve that Mrs Best Beer HQ got me for Christmas (along with several other New Zealand craft beers – reviews still to come!). 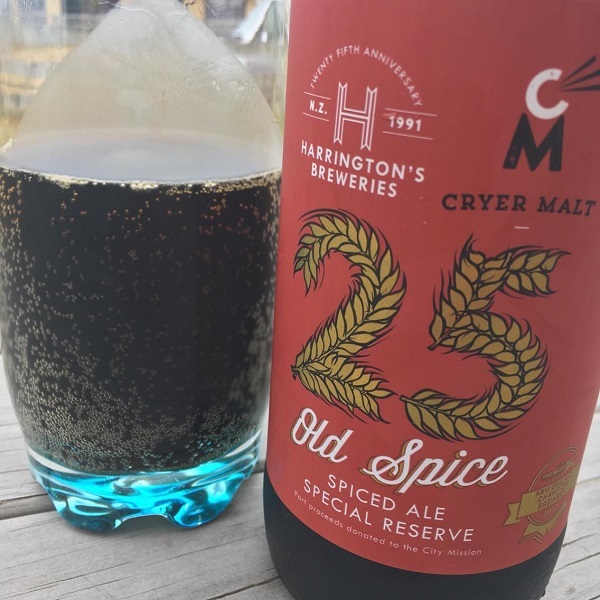 Blurb on the bottle: Commemorating 25 years in business, Harrington’s and Cryer Malt collaboratively brewed a Christmas cake inspired Spiced Ale. Part proceeds are going to the City Mission as a sign of their continued community support. Who? Crafted and bottle by the genuine folks at Harrington’s Breweries, 199 Ferry Road, Christchurch, New Zealand (established in 1991). I’ve reviewed two of the brewery’s beers before – its Rogue Hop NZ Pilsner, and ‘The Classy Red’ Extra Special Bitter. Tastes like: Christmas. As the blurb on the bottle says, Harrington’s Old Spice does indeed taste like a big old slice of Christmas cake in beer form. It smacks of fruit mince and cinnamon, and smells like nutmeg and festive cheer. My bottle of Old Spice Special Reserve poured fizzy and as black as the lump of coal that I was expecting to get for Christmas (which would have been fair reward for being a miserable prick all year). It’s medium bodied, without much head to speak of. The verdict: I hate Christmas cake (and anything else with raisins or sultanas in it) but I do like this beer. It’s fruity and festive – plus I like the idea of some of my beer money going towards the City Mission, especially at this time of year. Beer/book combination: One of my favourite things about the Christmas holidays is finally having time to sit down and read a good book. So, rather than recommend a movie, I’m going to tell you to check out Neil Gaiman’s awesome American Gods. They’ve made a television show about it now, but books are always better and this one is excellent.